The average cost of everyday household goods and services went up by 0.6% in the year to August. 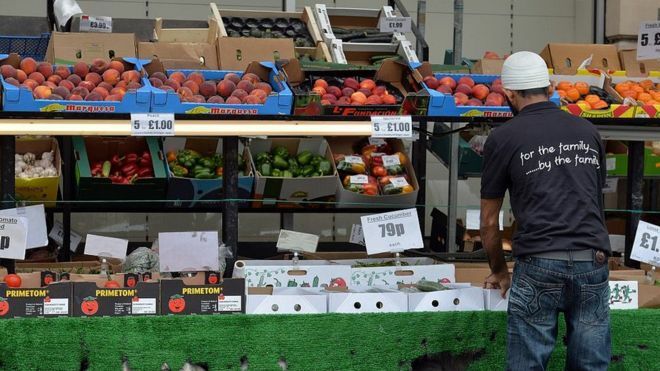 The UK inflation rate, as measured by the Consumer Prices Index (CPI), was unchanged from July. Rising food prices and air fares pushed prices higher, the Office for National Statistics said, partly offset by cheaper prices for hotel rooms. Economists had forecast inflation would rise to 0.7%, predicting the cheaper pound would push prices higher. ONS statistician Mike Prestwood said raw material costs had "risen for the second month running, partly due to the falling value of the pound". But he added there was "little sign of this feeding through to consumer prices yet". Essentially a very large 'shopping basket' full of goods and services on which people typically spend their money: from the cost of a cinema seat to the price of a pint at the local pub, from a holiday in Spain to the cost of a bicycle. In total, more than 700 household goods and services are measured, to assess if they are generally rising or falling in price. Prices are measured every month in 20,000 shops at 140 locations throughout the country. Some 180,000 separate price quotations are used each month to compile the final figure. 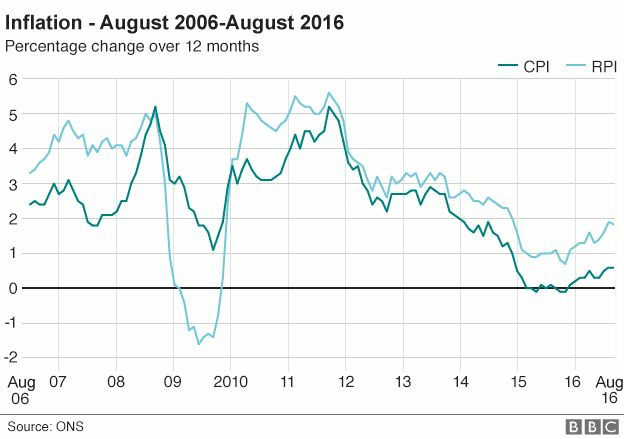 The Retail Prices Index (RPI) measure of inflation, which includes mortgage interest payments, dropped to 1.8% in August from 1.9% in July. Separate figures from the ONS suggest inflationary pressures are building for businesses bringing in materials from abroad. Materials and fuels bought by UK manufacturers rose by 7.6% in price. That was the fastest rise since December 2011, and compared with a rise of 4.1% in the year to July. The price of goods leaving the factory also rose 0.8%, compared with a rise of 0.3% the previous month. Ben Brettell, senior economist at Hargreaves Lansdown, said: "It is clear businesses importing materials from abroad are facing significantly higher costs. These companies must choose whether to absorb the increase or pass it on to consumers. "Assuming at least some will choose the latter route, this could lead to higher consumer prices down the line." The British Chambers of Commerce agreed that inflation was likely to pick up in the coming months, while forecasting group EY Item Club said the "only way is up" for inflation in the near term. Martin Beck, senior economic adviser to the EY Item Club, said it expected CPI inflation to rise above 2% - the Bank of England's target - by early 2017. Today's unmoved inflation figure could lead some to say there is little inflation risk. True, inflation is still low. In 2011 it was above 5% as the effects of sterling's financial crisis depreciation fed through to higher prices. Now, as in 2010, there are stirrings in the inflationary undergrowth. Gas and oil prices are expected to increase - as is the cost of food, where import price inflation is running at over 3%. The danger for politicians is a simple one. With average incomes increasing at just over 2%, it does not take much inflation to put real income growth firmly in negative territory.